Braces are certainly a great solution for getting teeth in shape and creating the perfect smile. But metal is not necessarily the way to go for everyone seeking a straighter smile. That’s where alternative orthodontic options come in, creating stunning smiles in a shorter time frame and without the obvious bulk of traditional braces. 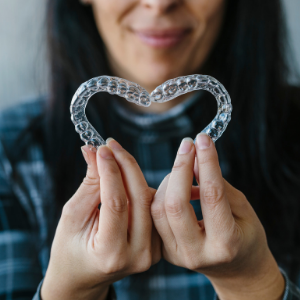 Here at Lifetime Dental Health, we are pleased to provide Invisalign® and Six Month Smiles®, both of which are clear brace systems that are far less noticeable than traditional metal braces, yet work to align teeth just as terrifically. Here is a bit about both systems, how they work, and what you can expect. No more “metal mouth” when you can be in the clear with the aid of Invisalign or Six Month Smiles. What is Invisalign Orthodontic System? The Invisalign Orthodontic System is a series of clear, removable aligners (unlike metal braces with brackets which are glued on and wired together) that straighten your teeth. This appealing aesthetic alternative to traditional metal braces straightens teeth with clear plastic aligners that are placed over and around the teeth comfortably. How do I know if Invisalign will correct my smile concerns? Research has shown that 60-70% of all orthodontic problems can be improved significantly with Invisalign invisible braces. So, chances are titled in your favor. But before we opt for this orthodontic solution, your dental consultation and exam will help determine if you will see the right results by using Invisalign. If you are a good candidate, we’ll proceed towards the next steps to get your smile looking its best. Since every bite is unique, we will use advanced 3D imaging to craft Invisalign aligners that fit your mouth perfectly. Your initial dental consultation with Dr. Barry or Dr. Love will entail a thorough evaluation. 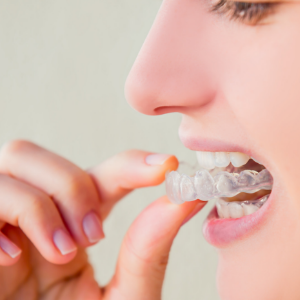 We will talk about your desires and goals and what your expectations are, so you are not caught off-guard, disappointed, or expect more than the Invisalign clear braces system can offer. We will take impressions and X-rays of your teeth that will be sent to the lab to design your customized clear aligners. Some patients require just 12 aligners total, while others need up to 48. Each aligner is worn for about two weeks at a time as the teeth shift towards their desired final positions. It all depends on your smile at the start and a reasonable outcome. If your straightening and spacing issues are relatively mild, you can see a new smile in about 9-12 months. More complex cases can take anywhere from 12-18 months. We can give you an estimate during your initial consultation so you have a ballpark idea of what your time frame will look like. Do I need to wear them 24/7? For the best (and fastest) results, we advise that you wear your aligners as much as possible, both during the day and while you are asleep. Only remove them when brushing your teeth, flossing, and eating. The Six Month Smiles system includes clear braces that straighten your teeth. On average, patients see a smile they are proud to show off in a quick six months. They are comfortable to wear and blend in with the teeth, so they are hardly noticeable. What is the Six Month Smiles process like? The straightening process involves light forces that shift the teeth into a better aligned position using brackets and wires like metal braces, but they are clear instead. They are fixed to the teeth so you won’t be able to remove them like Invisalign clear braces. Will I need to use a retainer once they are removed like many patients with metal braces must? In order to keep the teeth from shifting back to their pre-Six Month Smiles positions, a retainer is needed. The retainer selected can be removable or permanently bonded behind the teeth. It all depends on your preference at this point. Both teeth straightening options can be helpful for both teens and adults, provided the initial dental consultation deems these solutions as the right choice for the dental issue at hand. Both are comfortable to wear, discreet, and do a great job at aligning teeth. Talk to Dr. Barry or Dr. Love about Invisalign and Six Month Smiles to determine which orthodontic option is right for you. In a short time, your smile will go from so-so to stunning, without the metal braces you’ve been used to seeing. Straight teeth can come quickly. Stop hiding your smile and show off a set of straighter teeth you’ve been hoping for. Drs. Barry and Love are experts with both of these systems, and recommend both as excellent alternatives to metal braces, provided the patient is a prime candidate. They’re both clearly amazing alternatives!